My comrade Jonathon Aspey has been raving about the central winger role lately. In a nutshell, the central winger is a “new” type of midfielder. Much like the False 9, his distinguishable features lie in the fact that, unlike a traditional playmaker who stays behind the striker in the centre of the pitch, his goal is to drift out of the zone he is supposed to occupy by traditional standards. This drifting basically creates two problems for the opposite team. Either they let him drift wide, and his presence with both the winger and the fullback makes it three-on-two out wide; or they follow him, but leave space in the centre of the pitch for wingers or onrushing midfielders to take. The presence of a player who is making direct runs from the centre of the pitch tends to create difficulties for most defences as well as generate a lot of movement both on and off the ball. In theory, it sounds ideal for a strikerless formation. What it could really help me achieve is adding additional layers to my attack, both horizontally and vertically. The idea is that I employ my Targetganche to act as a sort of targetman to bounce balls off. Basically, we wanted a cross-pollination of the targetman role and the enganche role. In a way, it makes sense, as the enganche already encorporates some of the qualities a targetman is supposed to offer to a team. A targetman is a striker who is the target of passes from his teammates. A good target man will possess the strength to hold up the ball, hold off opponents and bring team-mates into play. Target men are often tall, physical players who operate with their back to goal. 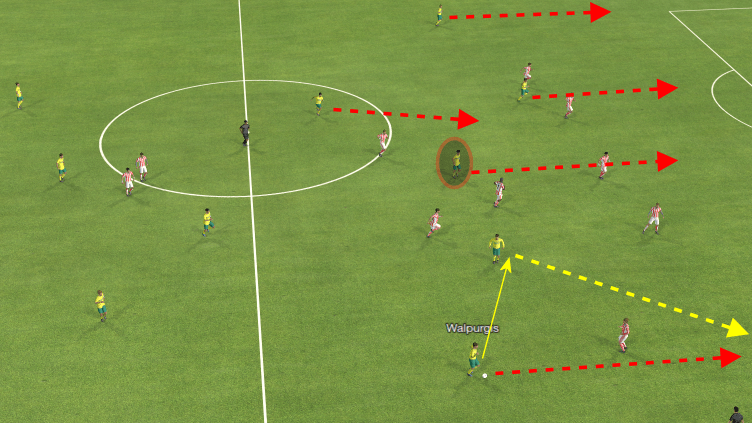 The Enganche is more of a static playmaker, a pivot around which the attacking flow of the game revolves. The idea is that the enganche has to hook the strikers into the supporting cast of players who are there to support them in their efforts. He is the player that receives the ball and chooses how and when to pass the ball to maximise the potential of the attacking movement. Mix those two up and you get the Targetganche™, or the Withdrawn Targetman I want to see in the game. He will hold up the ball and bring his team-mates into play, choosing how and when to pass the ball to maximise the potential of the attacking movement. Add the Central Winger to the mix, and I get the chance to add a whole new dimension of movement to the mix. The basic premisse is that the outter attacking midfielders add the verticality from central positions, the wing-backs bombing forward provide the necessary width and the central winger either links up with the attacking midfielders or wing-backs when he goes on a run, all the while the Targetganche remains fairly static whilst the runners pivot around him, whilst he looks to attract the passes into feet before laying it off to an oncoming player or slip the ball through between defensive channels to play someone in. The highlighted player is the Targetganche, the yellow line represents the movement of the ball, the dotted yellow lines represent potential passing lanes, the dotted red lines represent potential offensive runs, the blue line represents the defensive line. The image shows my Targetganche, Serrano, taking up a position with his back to goal. People are able to bounce the ball off this static withdrawn targetman. Apart from the rather obvious one-two option with Jankovic, Serrano has several other passing options available to him as well. This is basically where the various layers come into play. First of all, there’s the quite obvious central layer. One of the Shadow Strikers, Jankovic, passes the ball towards the Targetganche, Serrano. The second Shadow Striker has already started a forward run. With the defensive line pushing forwards to prevent us from seizing control in midfield, there is a lot of space behind the defensive line and a flick-on into space is a very real threat to this defensive setting. So far, I haven’t done anything special. The interactions I have visualised are not too different from the ones FM Analysis mentioned in his wonderful article about the same subject. 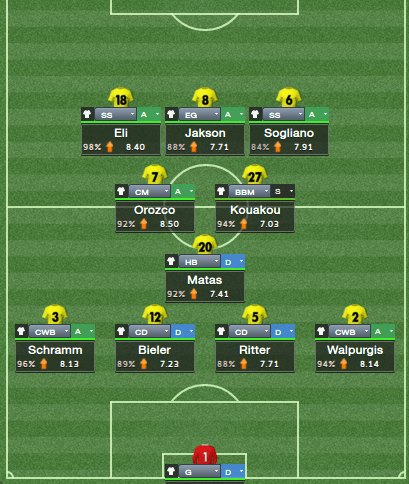 As I mentioned earlier, I wanted to implement a Central Winger as well. The Central Winger, which isn’t really showing in the screenshot, is supposed to be my third layer. In this position, he isn’t really adding to the situation. Let me show you a second screenshot to show you what I mean. The way I see it, the Central Winger can add an extra layer in two ways, basically forming a hybrid between the other two layers. 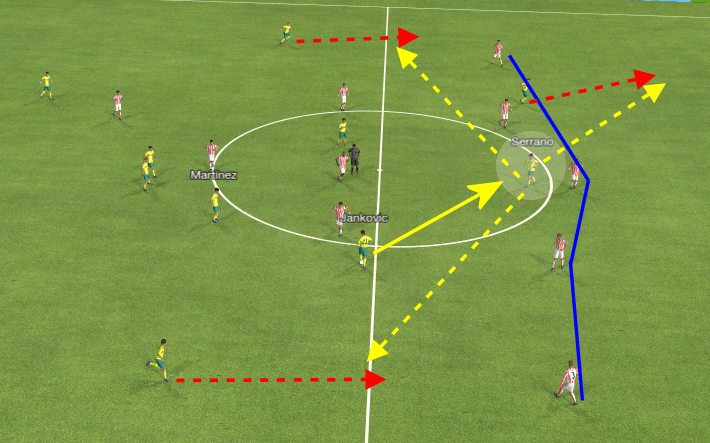 The highlighted player is the Central Winger, the yellow line represents the movement of the ball, the dotted yellow lines represent potential passing lanes, the dotted red lines represent potential offensive runs. In this situation, the Central Winger isn’t directly involved in the attack but as it progresses, you can sort of see what the Central Winger adds to the situation. I’ve highlighted the Central Winger, who has already overtaken the Targetganche in terms of positioning and is looking poised to make a late run into the box. Walpurgis, the wing-back, sets up a one-two with one of the Shadow Strikers before moving in a position for a cross into the box. The late run by the Central Winger adds to the standard movement by the other Shadow Striker, the left wing-back and the even later run of the Targetganche. The way the Central Winger plays in this instance is not very different to the role the Shadow Strikers play in my tactic. The Central Winger isn’t a one-dimensional weapon in my arsenal. In this instance he sets up a one-two with the left Shadow Striker, Olesen, before skipping past the wing-back and crossing the ball in for one of the other attacking midfielders running into the box. In this instance the Central Winger basically becomes a wide option when he bombs forward. With his diversity going forward, the Central Winger seems like an ideal addition to my strikerless repertoire, especially when used in an otherwise narrow formation. FM14’s AI seems to struggle with lots of vertical movement, which is exactly what a narrow strikerless formation delivers. The Central Winger can add some much needed width to this idea as well as adding to the regular vertical movement.